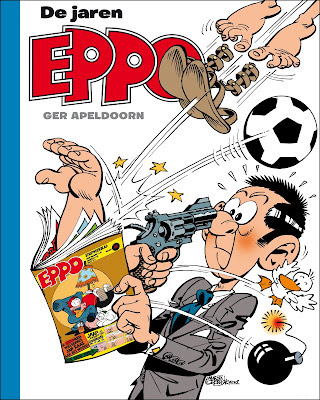 Today I was happy to announce my new project, a Dutch language book about the Dutch comics magazine Eppo, that was published between 1975 and 1999. My previous and similar book about Pep (1962-1975) was a big succes, so this is a logical (and highly anticipated) next step. The covre was made by Martin Lodewijk, one of the major artists/writers here in Holland and despite the fact that he is well into his seventies he can come up with and execute a cover design like no one I know. Good luck on your latest project and thanks for the Trigan Empire for those of us who don't know Dutch. The '60's Pep covers you featured a while go were quite good. Tomorrow I will upload a couple Eppo covers.